This lengthy journey across Spain is undertaken by the daily Arco train number 283 and provides a wonderful opportunity to enjoy a variety of scenery. The train is a conventional loco-hauled service using non-Talgo stock. The formation includes a buffet car serving light refreshments and snacks although you might wish to supplement supplies by taking along some extra drink and food. Irun is just over the border from Hendaye in France and can be reached by the local train service if crossing the border. The majority of the train goes to Coruna including the solitary first class coach. 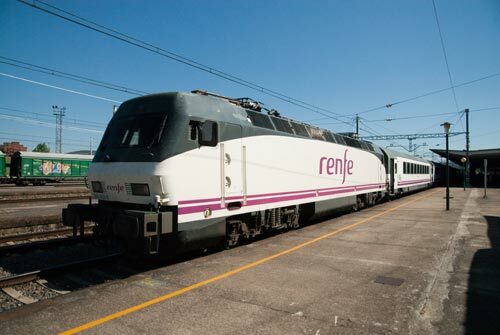 Note that first class is available from Irun to Coruna but not to Vigo so you need to purchase two tickets for the full journey (first class to Ourense and a second class ticket for the remainder of the trip to Vigo). There is also an option of a through second class coach from Bilbao to Vigo but more about that later. Photo - Typical motive power for the journey from Irun to Vigo. Departure was on time at 0845 and apart from a few minutes lost to speed restrictions in the first couple of hours precisely maintained the schedule with arrival a minute early in Vigo at 2014. The first section of the journey takes you through San Sebastian, Zumarraga and Altsasu following a valley between the hills. Sadly there is quite a lot of development close to the railway but this does not detract too much from the scenery. As the railway climbs onto the central plain there are significant engineering feats with many tunnels and viaducts as the railway twists and turns. Reaching Vitoria the landscape opens out with distant hills to the right. Small villages each with its church dot the land as you begin to understand how vast the interior of Spain really is. Miranda de Ebro is an important railway junction and with a scheduled stop of 25 minutes (1053 to 1118) there is a chance to stretch your legs as the single coach from Bilbao is attached to the front of the train. Another brief stop at Briviesca is followed by the modern station of Burgos Rosa de Lima which appears to be some distance from the town it is meant to serve. Leaving Burgos the train continues across the plains towards Madrid before bearing right and north to Palencia, Sahagun and Leon. With a booked stop of fifteen minutes Leon (1405 to 1420) offers another chance to get some fresh air although when this journey was undertaken it was like stepping into an over with temperatures in the low 40s centigrade! The landscape around Leon is arid and quite desolate although agriculture still seems to survive. It is also worth noting that in this part of the journey we saw many nesting storks taking advantage of the higher buildings including church towers and industrial chimneys! The first thirty minutes or so after Leon remain on the plain but ahead one can see the range of hills and mountains that the train is about to traverse. After station stops at Astorga and Bembibre the landscape has become more dramatic although evidence of the once-important coal mining industry can be seen along the railway. Ponferrada (1601 to 1602) is still a mining area and immediately after leaving the station you can see a row of rusty steam loco on the right hand side that once worked the metre gauge coal hauling line north to Villablino. The scenery is now dramatic for the remaining 4 hours to Vigo with the single track railway following a sinuous route through the valleys surrounded by hills and mountains. There are many reservoirs in this area and the blue sky reflected in their waters added to the scenic interest. Further stops at O Barco De Valdeorras and A Rua-Petin are made before reaching the railway junction of Monforte de Lemos (1732 to 1747) where the train reverses direction. Mention must be made of the loco drivers who manage to keep the train rolling at the maximum speed limit over a very demanding route. The skill required to accomplish this cannot be taken too lightly. The dramatic scenery continues unabated through to Ourense (1830 to 1838) where two second class coaches are detached for the remaining journey to Vigo. The remaining coaches continue to Coruna. Scenic interest continues as the railway descends towards the coast twisting and turning with much to see on the left hand side. If you are planning to ride this train it is well worth planning your trip so that the full journey is completed in daylight. Further short stops at Guillarei and Redondela de Galicia are the last before arrival at Vigo where views across the estuary are on your left. In conclusion I might add that this is one of the great railway journeys in Europe. For some sitting on the train for eleven hours and thirty minutes seems to be an endurance test. However the time flies by and with plenty of scenery to enjoy it is a wonderful way to spend a day! This short international journey takes about two hours and fifteen minutes and roughly follows the coast. Two services each day connect these important ports and it is a convenient way of travelling between these two cities.